Deck your dog with some bling! 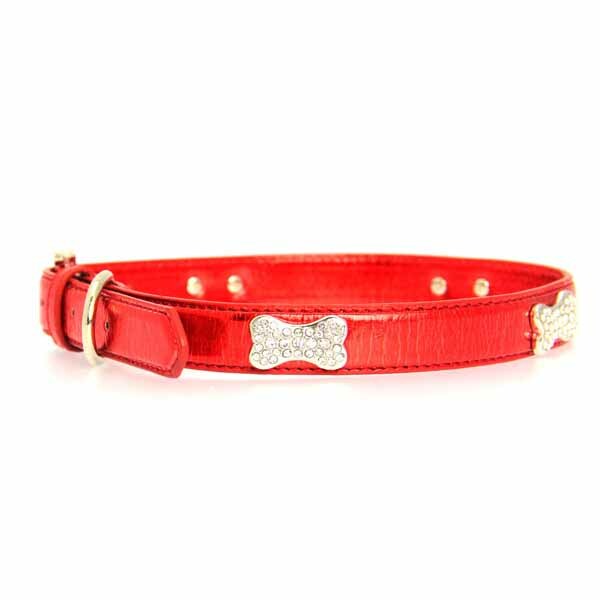 The Metallic Crystal Bone Dog Collar is a cool metallic red collar with rhinestone encrusted metal bone charms attached. 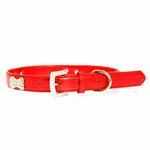 Made in the U.S.A.
Metal adjustable buckle with durable metal D-ring. Posted On 06/21/16 by Jacquelynn B from Bush, LA Yes, Jacquelynn B recommends this product! Posted On 10/11/14 by Starr D from Stockton, CA Yes, Starr D recommends this product! 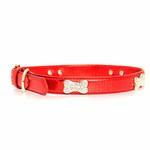 Being red and sparkly this collar is perfect for my dog named "Ruby". It's adorable for a tiny one like she is and is perfect for the holidays too! I love this company! I know they have quality products, directions are clear for measurements, have videos to further answer questions, and I love the personal thank-you on the receipt! Delivery has always been on time! Thank-you BaxterBoo!